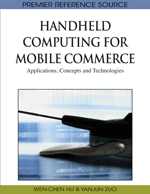 This chapter is about programming mobile handheld devices with a scripting language called AmbientTalk. This language has been designed with the goal of easily prototyping applications that run on mobile devices interacting via a wireless network. Programming such applications traditionally involves interacting with low-level APIs in order to perform basic tasks like service discovery and communicating with remote services. We introduce the AmbientTalk scripting language, its implementation on top of the Java Micro edition platform (J2ME) and finally introduce Urbiflock, a pervasive social application for handheld devices developed entirely in AmbientTalk. The hardware characteristics of mobile devices introduce certain phenomena that must be dealt with when writing mobile computing applications. In this section, we summarize these hardware phenomena. Subsequently, we discuss related work in the field of programming languages and middleware that has influenced the design of AmbientTalk.